The Soo Theatre Project will be hosting this year’s annual Christmas Tour of Homes and Tea on Sunday, December 11th. This year’s tour will feature the four beautiful homes of Mary and Chuck Weber, Julie and David Weir, Allie Brawley, and Tom Sherman. The Tour will be from 1-4pm and Tea will be from 2-5pm. This year’s Tea will take place at the Soo Theatre’s Studio E located at 539 Ashmun Street. The Tea will be hosted by Dianna George and members of the Footlight Dance Company. There will also be a Christmas program featuring STARS students and faculty to entertain patrons as they enjoy their tea. Door prizes will be awarded as well as a Silent Auction. This is a very popular Christmas tradition for many people so mark your calendars! Tickets are just $15 and will be available at the Soo Theatre office. For more information contact the office by phone at 632-1930 or email at sootheatre@gmail.com. You can also find us on Facebook! This 1975 British musical comedy film parodies science fiction and horror films. Still in limited release nearly 36 years after its premiere, it has the longest-running theatrical release in film history. This movie is about a newly engaged couple who have a flat tire and go to a nearby castle to ask for assistance. Little do they know that they have stumbled upon a crazy household of aliens who are involved in some very odd situations and creations. The movie will be shown at the Soo Theatre for one night only, Saturday, October 15th at 11pm. The box office will open at 10pm. Audience participation kits will be available for purchase prior to the movie. Tickets are just $10 and will be available at the door. 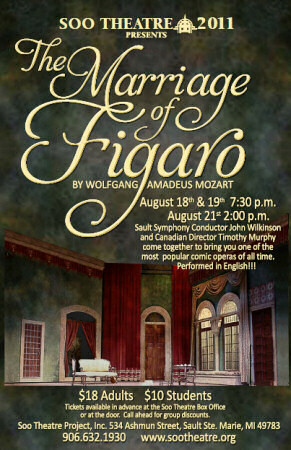 For more information, call the Soo Theatre at 906-632-1930. The Rocky Horror Picture Show is rated R – Restricted – Under 17 Requires Accompanying Parent or Adult Guardian. Check the Soo Theatre Project website at sootheatre.org and like us on Facebook - Soo Theatre Project, Inc.
4th Annual Show of Shows Sunday Afternoon! There will be a cook-out in front of the theatre starting at 12:30pm so you can enjoy lunch and then attend the 2pm show. 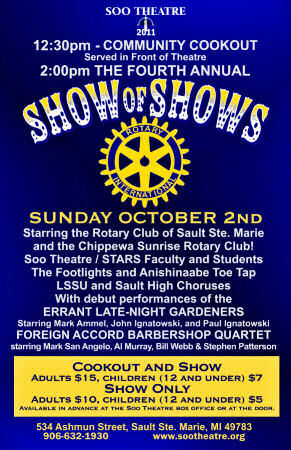 This year’s show will feature acts from the Rotary Club of Sault Ste. 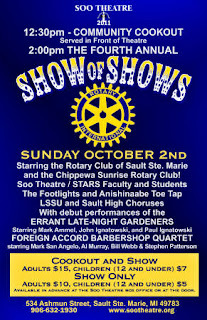 Marie, the Chippewa Sunrise Rotary, Soo Theatre/STARS faculty and students, Footlights Dance Company, Anishinaabe Toe Tap, LSSU and Sault High Choruses, Foreign Accord Barbershop Quartet, and the debut performance of the Errant Late-Night Gardeners. There is something for everyone in this show which is sure to please audience members of all ages. One of the Soo Theatre’s most popular events of the year, the “Show of Shows” is a great way to wrap up the summer season and see one last live show before winter sets in. 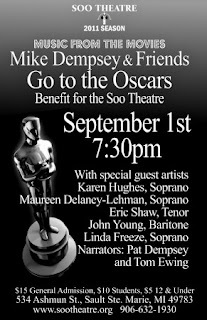 on Thur., Sept. 1, at 7:30 p.m.
Mike Dempsey has created yet another musical production for the entertainment of our local communities, this one called "Mike Dempsey and Friends Go to the Oscars." This performance will take place at the Soo Theatre on Thursday, Sept. 1, at 7:30 p.m. Tickets are now available at the Soo Theatre, 534 Ashmun St.
Large audiences enjoyed his last two Soo Theatre productions, one featuring the music of George Gershwin in 2009, and one featuring the music of Rodgers and Hammerstein last year. The singers and instrumentalists and narrator of the last two years will be joined this year by even more talented artists. And as in the last two Dempsey productions, the artists are all giving freely of their time and talents as a fund-raiser for the Soo Theatre Project, for which the local theatre is very grateful. Dempsey was born and raised in Sault Ste. Marie. He attended St. Mary’s and Sault High Schools. He received both bachelor’s and master’s degrees from Michigan State University, and then served in the U.S. Army. He has been the choral director at Pontiac Central and Pontiac Northern High Schools, and also served as choir director at several Oakland County area churches. 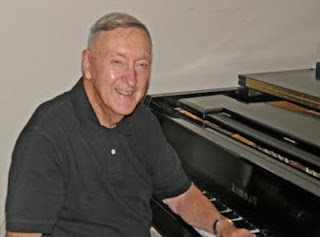 In addition, he has been music director for such large-scale musicals as South Pacific, Oklahoma, Carousel, The King and I, The Music Man, Kiss Me Kate, Superman, You're a Good Man, Charlie Brown, Mame, My Fair Lady, Gypsy, Sweet Charity, Lil’ Abner, and The Sound of Music. In 1995 he founded his singing group “Mike Dempsey & Friends.” In addition to writing the script and arranging the music, Mike serves as pianist. This small group has performed composer-themed musicals throughout Southeastern Michigan, and the Sept. 1 show is another of these. Dempsey has been married to Ellen for 54 years, and they have three sons . As a published composer he is a member of ASCAP and was chosen to accompany Tony award-winner Anna Maria Alberghetti in a Detroit area performance. He is delighted to return to his hometown and the Soo Theatre, where he has many happy memories. Dempsey is looking forward to an evening at the movies with his Sault audience. Long-time Sault residents may recall Dempsey’s parents, Athaleen and Tom. Tom's brother Pat will be on stage this time, also, playing the part of Sammy Cahn. Pat was also born and raised in Sault Ste. Marie and is a music professional in Port Huron. Other artists performing in this musical production are: Karen Hughes Beacom of Pickford, local soprano star of many Soo Theatre productions and both of the other Dempsey shows; Maureen Delaney-Lehman, another fine soprano, who has sung in the other local Dempsey shows; Eric Shaw, professional tenor coming in from Toronto for the third year, who was also born and raised in the two Saults; Linda Freeze, mezzo-soprano, coming from the Detroit area for the first time, who has sung in other Dempsey productions including his one-woman show featuring the music of Judy Garland; and John Young, baritone, coming for the third year from the Detroit area. The narrator is the Sault's own Tom Ewing of Sovereign Communications. Instrumentalists are Gig Stewart, double bassist from Petoskey, and local percussionist Eric Gadzinski. Audience members will know most, if not all, of the music being performed at this show, and will sometimes be invited to sing along with the piano. The words will be provided. Please plan to attend and enjoy this wonderful evening of movie music. Join us at the Soo Theatre on Friday, August 26th at 7pm for the "Northern Dance Collective 2011" performance. The dancers are sure to light up the stage! Open to the public - admission by donation. For more information, call (906)632-1930. Wolfgang Amadeus Mozart’s famed opera The Marriage of Figaro will bring alive the historic stage of the Soo Theatre Project August 18, 19, and 21st. Sault Symphony Conductor John Wilkinson and Canadian Director Timothy Murphy have come together to bring you one of the most popular comic operas of all time. This hilarious opera will be presented in English with Resident Soprano Karen Hughes Beacom being joined by visiting professional guest artists John Arnold, Tom Gunther, and Dawn Krogh. The rest of the cast will be comprised of local talent including members of Soo Theatre’s recent hit Joseph and the Amazing Technicolor Dreamcoat. Show times are at 7:30pm with a 2pm matinée on the 21st. Be sure to get your tickets now by calling 632-1930 or stopping in the office at 534 Ashmun Street. Call ahead for group discounts. On Friday, August 12, one of the world's best guitar players and one of Canada's best singer-songwriters return for one night only to the Soo Theatre. Don Ross has wowed audiences with his intricate playing style and is one of the most viewed performers on YouTube. Brooke Miller's heartfelt and introspective music has been winning fans since a young age and has earned comparisons to Bruce Cockburn and Joni Mitchell. If you don't know these artists, you should. 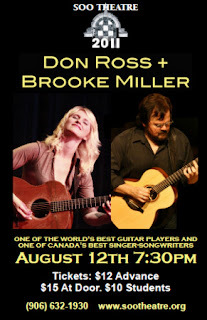 You can see some of Don's amazing fretwork HERE and check out Brooke HERE. You can see them together live from the Soo Theatre HERE. If you're a fan of guitar, you'd have to be daft to miss this show! This will be the first US date on their world tour. 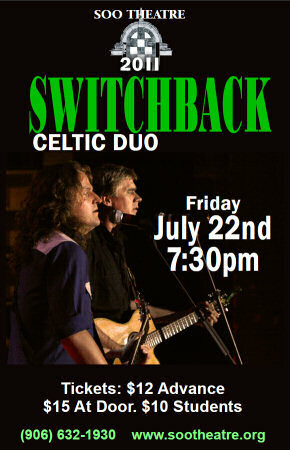 Don't miss this rare opportunity to see two of today’s finest musicians in an intimate setting. Joseph at the Soo Theatre! 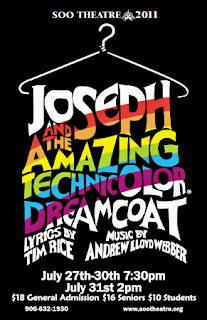 Community members from the Sault and surrounding areas, including Brimley, Pickford, Hessel and Rudyard have come together to bring you the thrilling biblical story of JOSEPH AND THE AMAZING TECHNICOLOR DREAMCOAT. The cast, crew, and production staff have been hard at work for two months and it shows in their high energy performance. This Andrew Lloyd Webber musical takes you on a tour of different music styles with everything from country western to Elvis and calypso not to mention the large Broadway style group numbers. Local talent Matt Gilbertson will be leading the cast as Joseph, a role made famous by Donnie Osmond. A cast of 40 will join him, including two local performers and STARS students, Lola Kennedy (Narrator) and Christian Perron (Judah and Butler), who will both be departing for New York in the fall. Lola has been accepted on a scholarship to New York’s American Musical and Dramatic Academy to pursue her vocal career, and Christian will be attending the American Academy of Dramatic Arts on his way to what will surely be a successful acting career. Their voices are tuned, the costumes are sewn, the lights are bright, and the set pieces are painted. Director Bob Koger says, "I am thoroughly pleased with the work these outstanding performers have devoted to this show. It will be a long time before you will see another live musical that blows you away like this company will!" Do you have a child interested in music? The Soo Theatre will have a special “Music is a Family” workshop with singer/songwriters Switchback on July 22nd at 3pm. This informative presentation is geared towards 11-18 year olds. These two incredibly talented performers will introduce your children to common elements shared between all forms of music. There will be demonstrations of a variety of instruments including the mandolin, bass guitar, and percussion boards. The presentation will be approximately 45 minutes long with a 15 minute question and answer session. Admission is only $5. Come Out For The Magical Land of Oz June 30 and July 1! STARS Musical Theatre Camp will be presenting the culmination of their hard work in two performances of “The Magical Land of Oz” Thursday June 30th at 7 pm and Friday July 1st at 2 pm. Over the course of this 3-week camp, children ages 5-14 have mounted a full scale musical production. Campers have learned their lines, put on their dancing shoes, harmonized their voices, and even helped with their own sets, costumes, and props. Our next generation of performers are ready to show you what they’ve got, so come on out and see the future of performing arts for our community! Yo Ho Ho! Join Our Pirate Cruise on Thursday, June 9! On Thursday, June 9, 2011 the Soo Locks Boat Tours will once again be sponsoring their famous Pirate Cruise for the third consecutive year as a fundraiser for the Soo Theatre Project. The festivities will begin at 6pm at Soo Locks Boat Tours Dock One. This is the third consecutive year the amazing pirate crew (Soo Locks Boat Tours staff) will dazzle seafarers with their pirate antics, including a performance on the dock before they set sail. Once upon the rapid seas, there will be pizza, pop, and water for all to enjoy while listening to pirate stories, singing pirate songs, and winning pirate prizes. 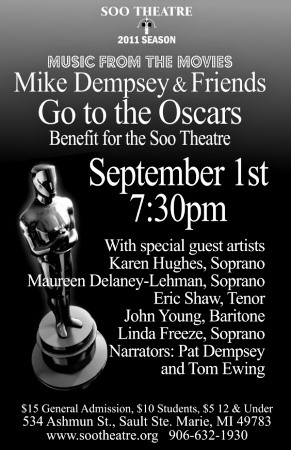 Tickets are on sale now at the Soo Theatre Project. Stop in at 534 Ashmun Street or give us a call at 632-1930. Seating is limited, so be sure to get your tickets early! Join a Sound Celebration at the Soo Theatre on June 4! 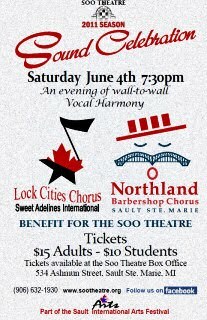 For the fourth consecutive year audiences can join the local Northland Barbershop Chorus and the Lock Cities Chorus of Sweet Adelines, International for an evening of a cappella music at the historic Soo Theatre. The performance will feature a variety of music including selections from the Beatles, Billy Joel, the Inkspots, the Platters, the Beach Boys, and Elton John songs from “The Lion King” performed by the International choruses comprised of members from both sides of the St. Mary’s River. The Northland Barbershop Chorus is celebrating 50 years of singing, while the Lock Cities Chorus celebrated their 25th Anniversary last year. These two groups are eager to share their passion for music with you, so don’t miss your chance to see these local talents in what is sure to be an exciting musical event. Tickets are available at the Soo Theatre/STARS office. For more information call 906-632-1930. 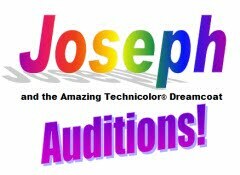 The Soo Theatre Project is pleased to announce open auditions for this summer's Broadway musical Joseph and the Amazing Technicolor® Dreamcoat. Director Bob Koger and Music/Vocal Director Karen Hughes will be looking for community members to fill roles for 17 men and 12 women, as well as a 20-30 member children’s choir. All auditions will take place at the Soo Theatre, located at 534 Ashmun Street in Sault Ste. Marie, Michigan. Children’s choir auditions will be held on Sunday, May 1st from 2-4pm. **New** We have also added a second day of Children's Choir auditions for Wednesday May 4th 3:30-5:30 pm. Children in grades 3-6 are encouraged to audition for the production. There is nothing for children to prepare in advance of the audition. Auditions for the cast members will be held on Tuesday, May 3rd and Thursday, May 5th from 7:00-9:00pm each night. There is no need to prepare any audition materials, but candidates may bring a prepared song, if they so choose, and are only required to attend one of the audition times in order to be considered. Joseph and the Amazing Technicolor Dreamcoat is the second musical written by the team of Andrew Lloyd Webber and Tim Rice. It moved on to a Broadway production and was further adapted as a straight-to-video film and traveling Broadway presentation starring Donny Osmond. “Joseph” is a high-energy, fast-paced production with very little spoken dialogue that has a history of exhilarating its audiences since moving to the stage in 1970. The Soo Theatre Project production performs for the public on July 27th – 31st, 2011. Call the Soo Theatre Project Office at (906) 632-1930 to sign up for auditions. Don’t miss out on your opportunity to be a part of this wonderful production! To get the latest news, follow us on Facebook - Soo Theatre Project, Inc. Announcing Our 2011 Summer Show Season! Soo Theatre Project is pleased to announce the schedule for our 2011 summer season (see flyer), opening with a combined STARS/Algoma Youth Orchestra Festival Concert on the 15th of May, followed by the 6th Annual STARS Dance Show May 20th-21st, and ending with the ever popular Rocky Horror Picture Show October 14th-15th. Throughout the summer and fall there will be a wide variety of live shows and programs for your viewing pleasure, including the musical Joseph and the Amazing Technicolor Dreamcoat July 24th – 31st directed by Bob Koger, and Mozart's opera The Marriage of Figaro August 18th-19th & 21st produced by Karen Hughes. Many artists, both local and professional, will grace the Soo Theatre stage, as they offer productions from the STARS Children’s Musical Theatre summer camps, dance camps, talent competitions, and variety shows. National and international music groups will also be performing, including Don Ross & Brooke Miller of Canada, Celtic duo Switchback, and California’s The Kid and Nic Show. Tickets for all summer productions will go on sale in late May. Audition dates for the musical and opera programs will be announced soon, so keep an eye on the Soo Theatre Project’s website www.sootheatre.org or call the office for more information at 906-632-1930. Join us on Facebook by becoming a fan of the Soo Theatre and be among the first to get updates and information. STARS Dance Fundraiser at Frank's Place Mar 31! Don't miss this opportunity for great food and excellent service! STARS dancers and staff are looking forward to helping serve your meal! There will be a recital tonight (Friday March 4) for intermediate and upper level STARS music students. The recital will start at 7:00 at the First Presbyterian Church located at 555 Bingham Ave. Admittance is by donation. This promises to be a delightful evening of voice, piano, and strings, so don't miss it! You can call the office for more information at 632-1930. STARS (Soo Theatre Arts Resource Studios) is pleased to announce that they will be continuing to offer Watercolor classes taught by local artist Randy Krause. Classes will begin March 4th and run for 5 weeks. Watercolor for Kids will be on Friday afternoons from 4:00-5:00pm with all materials provided. The Watercolor Techniques class for adults will be on Friday evenings from 5:15-7:15pm. Please bring your own materials to the adult class. For more information or to register please call the office at 632-1930. STARS (Soo Theatre Arts Resource Studios) is pleased to announce that they have added Beginning Acro Dance to their schedule with instructor Courtney Bailey. For more information call the office at 632-1930 or stop in at 534 Ashmun Street. STARS (Soo Theatre Arts Resource Studios) is very excited to announce that Allie Brawley of Northern Life Yoga will be offering a Teen Yoga class at the STARS studios. Classes start February 1st and will be held from 4:30pm – 5:30pm at the student rate of $5 per session. For more information or to register call 632-1930 or stop by 534 Ashmun Street. New Dance & Music Classes! STARS (Soo Theatre Arts Resource Studios) will be presenting an 8-week Beginning Group Piano class with instructor Ronda McGreevy beginning January 31, 2011 at Karen Hughes Beacom’s music studio in Pickford. Classes will be offered from 5:00-5:45pm for 8-10-year-olds, 6:00-6:45pm for 11-13-year-olds, and 7:00-7:45pm for 14-18-year-olds. Dance instructor Courtney Bailey has returned to STARS to teach intermediate and advanced Acro Dance classes, as well as intermediate and advanced Lyrical/Jazz on Wednesday evenings in the STARS dance studios. These new classes will begin January 26th. STARS is located at 534 Ashmun Street, with office hours from 9:30am–6:30pm Monday through Friday. Stop by or call (906) 632-1930 to register or for more information. 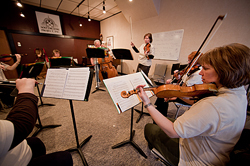 STARS (Soo Theatre Arts Resource Studios) has expanded class offerings in their Music Program. First Steps in Music will be offered on Monday’s starting in February from 11-11:30am for 2-3 year olds and from 11:30-12pm for 4-5 year olds. Taught by Karen Hughes, the students will participate in engaging musical activities designed to stimulate their artistic senses. STARS is located at 534 Ashmun Street, with office hours from 9:30am – 6:30pm Monday through Friday. Stop by or call (906) 632-1930 to register or for more information.